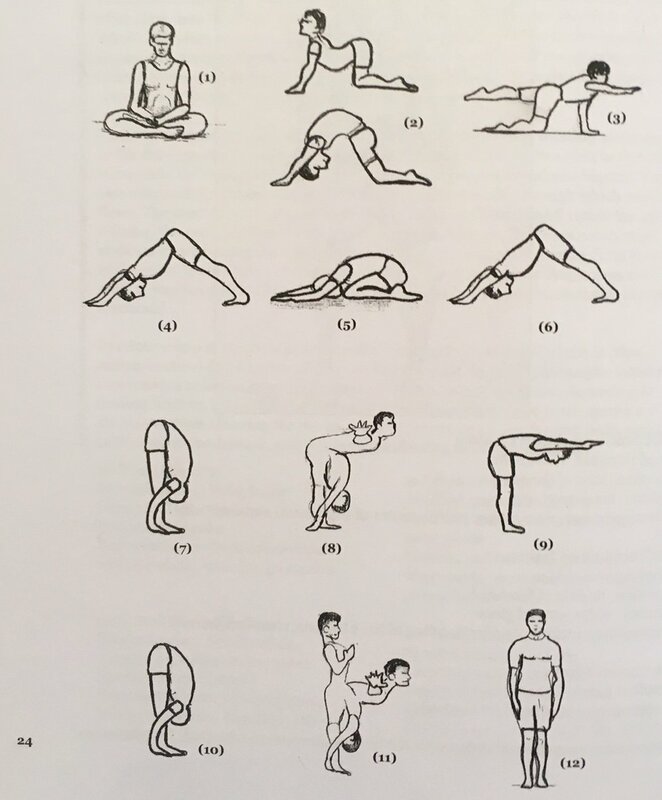 I was delightfully surprised when I recently found out that one of the inmate artists who has been participating in PATH art projects - Mr. Benjamin Ballard - had illustrated all the yoga poses in a 103 page book titled YOGA: A Path For Healing and Recovery published by the Prison Yoga Project, and made possible by the Give Back Yoga Foundation’s financial support for its printing and national distribution. So far 28,000 copies of his book have been sent free of charge to men and women incarcerated in U.S. prisons who have requested it. 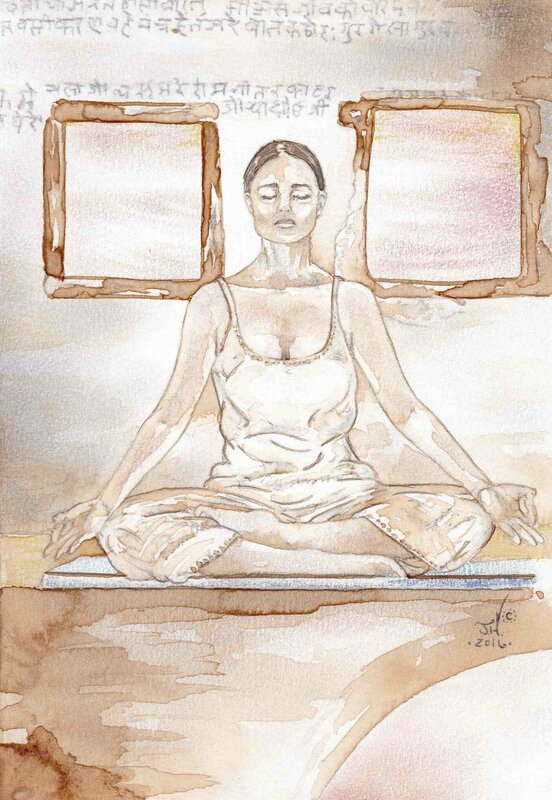 Hence, the Prison Yoga Project supports incarcerated people with trauma-informed yoga and mindfulness practices to promote rehabilitation, reduce recidivism, and improve public safety. 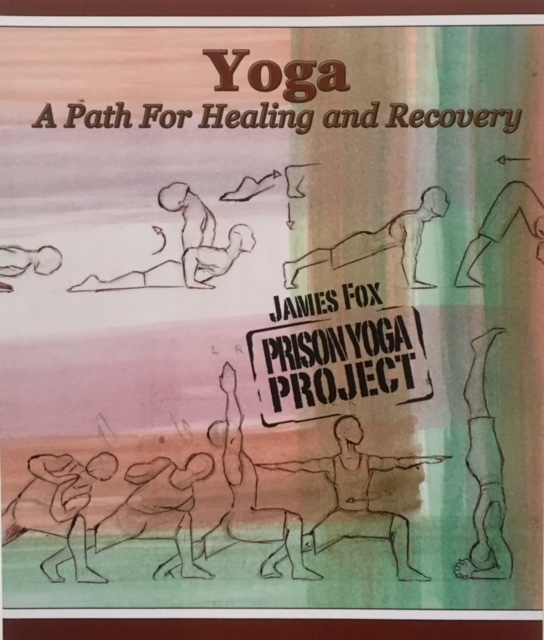 Mr. Fox began teaching yoga and meditation to prisoners at San Quentin Prison in 2002 and has since led practices and inspired the establishment of yoga programs in prisons and jails across the U.S. and internationally. He has trained thousands of teachers who have replicated PYP’s methodology in correctional facilities in 28 states, India, Mexico, Norway, Sweden, the U.K. and The Netherlands. Now that’s mighty impressive! Inmates must provide not only their full name and correctional facility address, but also their assigned prison number in order to successfully receive a free copy. 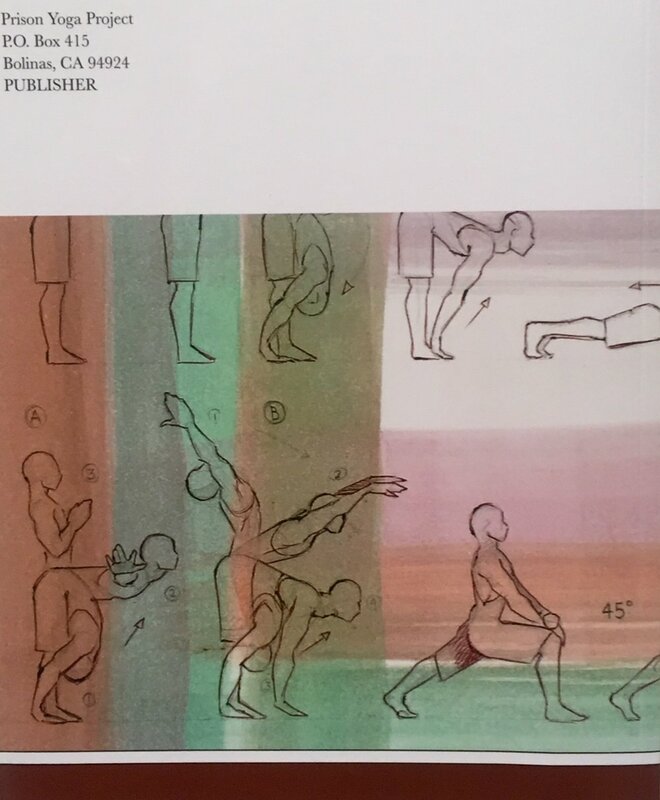 While The Prison Yoga Project has specially trained teachers who are leading classes in hundreds of prisons and jails around the world every week, there are still many prisoners who don’t have access to these tools for self-rehabilitation. I fully acknowledge and support this non-profit and the invaluable work that they are doing! So, if you feel so inclined to also help them grow their reach and important impact, you may send them a donation HERE. Saturday February 16th initially threatened to rain, but with luck, aside from a brief shower, it remained fairly sunny and dry for my excursion across the San Francisco Bay to the Island of Alcatraz. 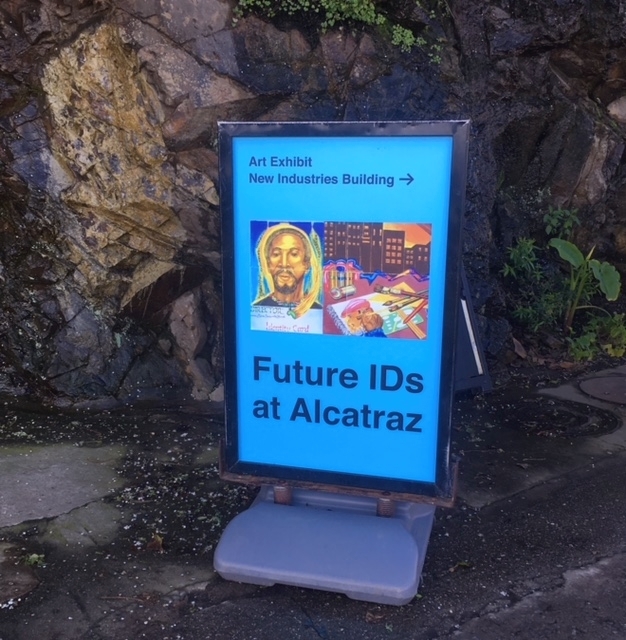 I took the 11am ferry from Pier 33 and once on the Alcatraz side, walked the steep road up to the New Industries Building where the current “FUTURE IDS AT ALCATRAZ” exhibit is installed. 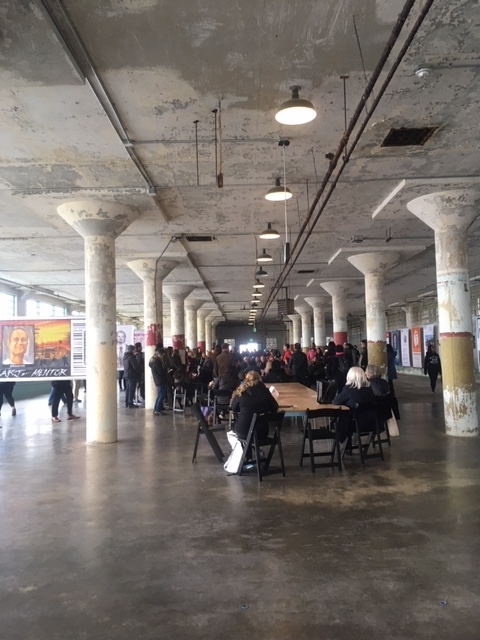 Future IDs at Alcatraz is a yearlong project, exhibition, and series of monthly public programs hosted by the Golden Gate National Parks Conservancy. The installation features ID-inspired artworks created by incarcerated individuals as they conceive and develop a vision for a future self. such as father or mother”. 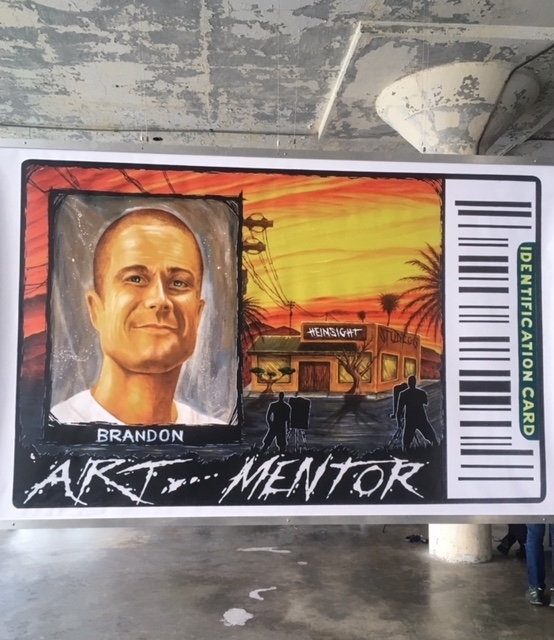 It’s a brilliant visual art conception and a stark contrast to prison-issued IDs as these artworks represent individual stories of transformation. The exhibit was curated and installed by artist and Arizona State University art professor, Gregory Sale. 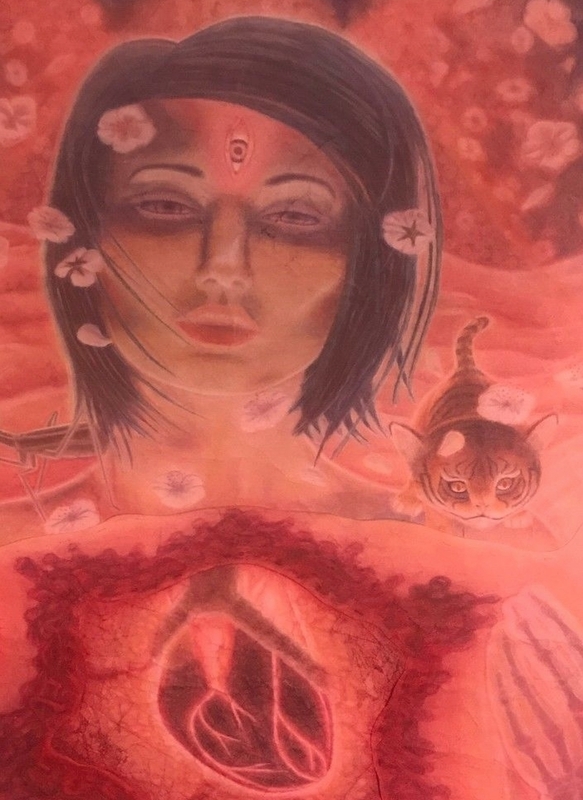 I met Mr. Sale last year and was delighted (and honored) to be invited to collaborate in part by providing artwork created by some of the incarcerated artists who regularly participate in PATH art related projects. One PATH artist in particular is Cuong (Mike) Tran whose work can be seen in the show. This particular project is supported in part by grants from Creative Capital Foundation, SPArt (social practice art), and the Herberger Institute of Design and the Arts, Arizona State University. It was developed during artist residencies at Montalvo Arts Center, Headlands Center for the Arts, and The Bunny House. If you get a chance to go out to the island, I strongly recommend that you take in this exhibit. Aside from the exhibit, the New Industries Building is also set up as an art workshop studio for visitors to the Island. So, get your art on, and enjoy! I first met Tio MacDonald when he initially expressed interest in attending the opening reception for “UNCHAINED ARTISTS” – a collaborative art exhibit between between PATH and ARtReach where original artwork by incarcerated artists (including San Quentin death row artists) was displayed at the Bank of Marin in Mill Valley. Tio MacDonald is the Chief Editor of the “East Oakland Times, LLC” – a multi-media publication based in the SF Bay Area. 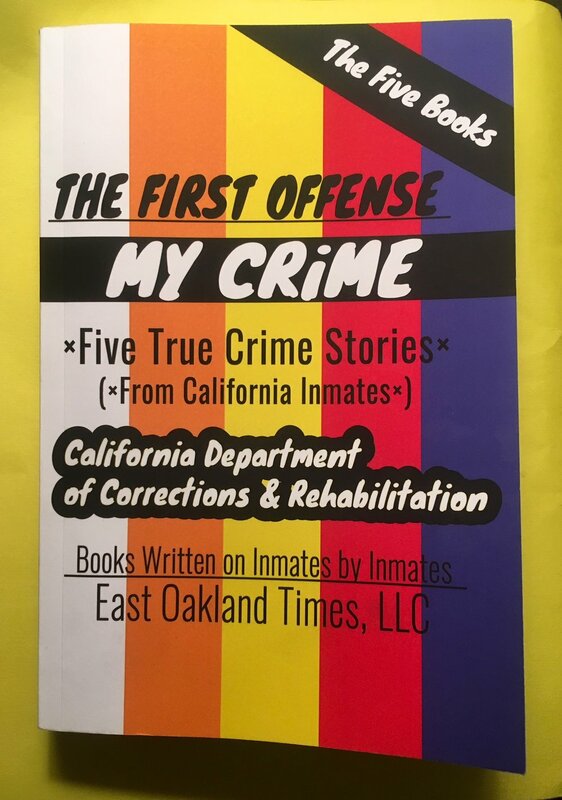 EOT projects include quarterly print publication for free distribution on the streets of East Oakland; Publication of original inmate art and books; MY CRIME SERIES (books written on inmates by inmates – available for purchase via Amazon in paperback, kindle and/or audio book. So, check it out! Stories presented in the THE FIRST OFFENSE: My True Crime Stories are often raw, and while you may not agree with an individual inmate’s attitude or position, or prior actions in crime that led to incarceration, the five books of the MY CRIME Series (written on an inmate, by an inmate) “…propose to candidly communicate the upbringing, life experience and motivations of the incarcerated”. “They are intended to present an opportunity for open dialog with the public regarding crime and punishment”. Aside from the above journalistic projects, EOT delivers podcasts from California’s condemned row. One such podcast caught my attention. It features a man by the name of “Rual” who is on San Quentin’s death row. It’s just a tad over 27 minutes in length; interesting, inspirational and positive. “Rual” discusses how life as a condemned inmate at San Quentin brought about a conversion of thought and mind and action and spirit, and how life goes on in prison whether in the main line or on death row and how and why inmates have a choice to not live statically. Myself, having served as a Petit Juror on numerous occasions, as well as a Grand Juror for a Newark, NJ court of law in the 2000’s, I can personally attest to the fallibility of the justice system. I also personally know people who were incarcerated for many long years who were innocent, and only until proven innocent with the help of organizations such as THE INNOCENCE PROJECT and through DNA testing, that they were released and exonerated. Such is the case of Keith A. Harward who will be featured on a Netflix documentary this Fall. GUALALA ART EXHIBIT A MAJOR SUCCESS! Returned to Mill Valley this past Saturday evening, January 26th, from my trip up the coast to the Gualala Arts Center where the "Unchained Artists: Portraits and Dreams" exhibit took place. First, I’d like to thank the Gualala Arts Center for hosting the show, to Wendy Bailey for her vision and unfailing hard work; to Ken Bailey Grading and Underground whose generous underwriting made this exhibit possible. Also, special thanks goes out to Heidi Endemann and Roberta Tewes of the Stewart-Kummer Gallery for donating mat board for the art. The exhibit was a MAJOR success...not just in sales, but for the fact that people unanimously loved the show. Numerous comments written in the Guest Sign-In book that it was one of the best art shows that they've seen in the Burnett Gallery in years! It’s my experience that most visitors to opening art receptions attend to socialize, drink wine and eat food that's set out. 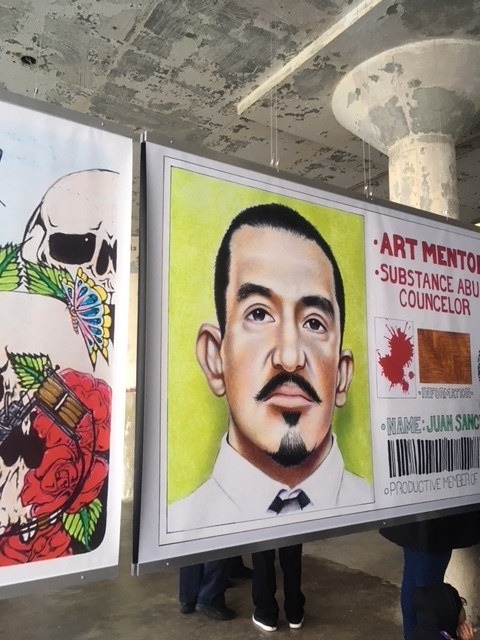 But, with this recent inmate art exhibit, folks were held fascinated; grouped around and staring at the artwork to discuss the different pieces on display. The show opened peoples' minds and hearts to the plight of inmates and inmate artists that they were previously unaware of before. So, in that sense, I consider it a major success. "Authentic, fearless and beautiful art for the soul. Everyone is valuable and shining”. “Powerful, creative expression! Thank you. Freedom manifested thru art! 4th image is of Wendy Bailey, curatror/installer of this show. As Founder and Director of PATH, I'm the first to share that PATH is not the only game in town that helps provide a creative outlet and visual artistic expression to those who are incarcerated. Between January 10th - March 28th, The MARIN CENTER'S Bartolini Gallery; 10 Avenue of the Flags, San Rafael, CA will be featuring INSIDE INSIGHTS: San Quentin Arts in Corrections. 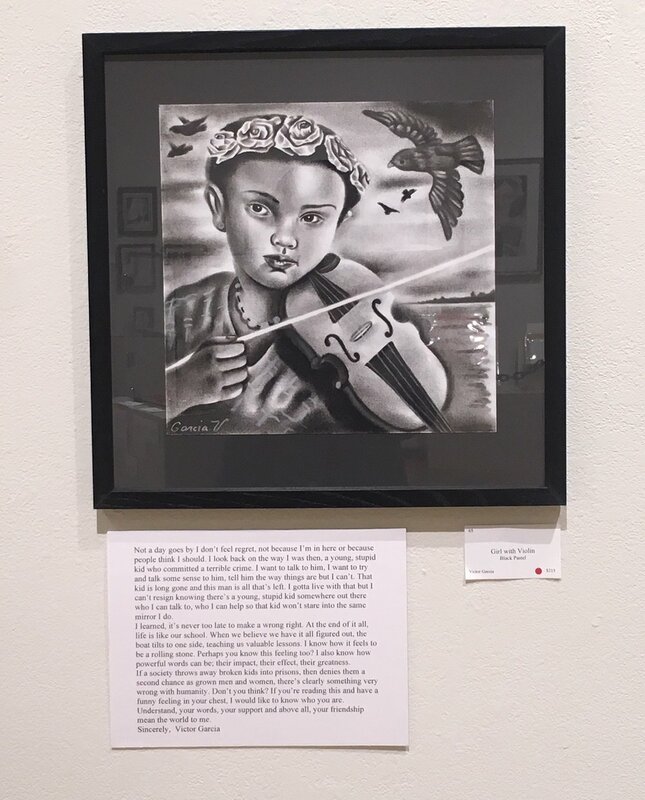 This special exhibit will showcase many works, including 25 original paintings, prints and sculptures created by San Quentin State Prison inmates who participate in the Arts in Corrections (AIC) program and specifically under the auspices of the William James Association’s “Prison Arts Project”, which was started in 1977. 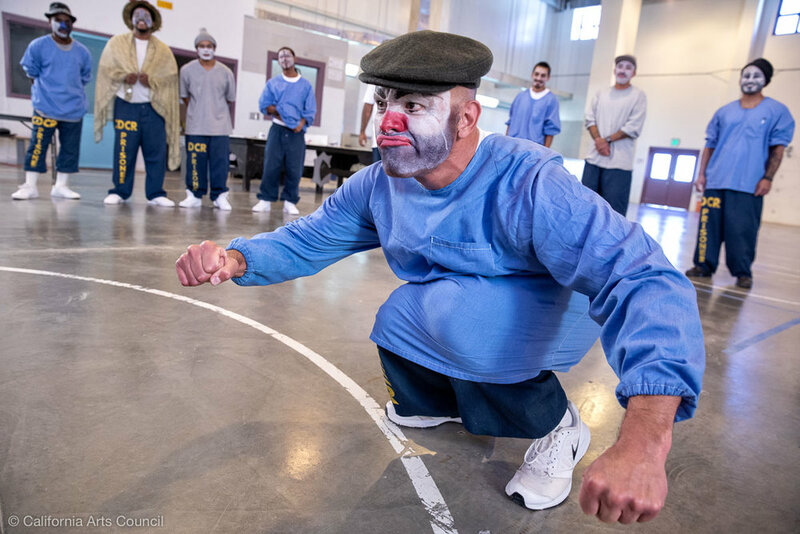 "Arts in Corrections is based on the belief that when institutionalized individuals participate in the arts their self-esteem and outlook on the world is significantly affected". And positively so! 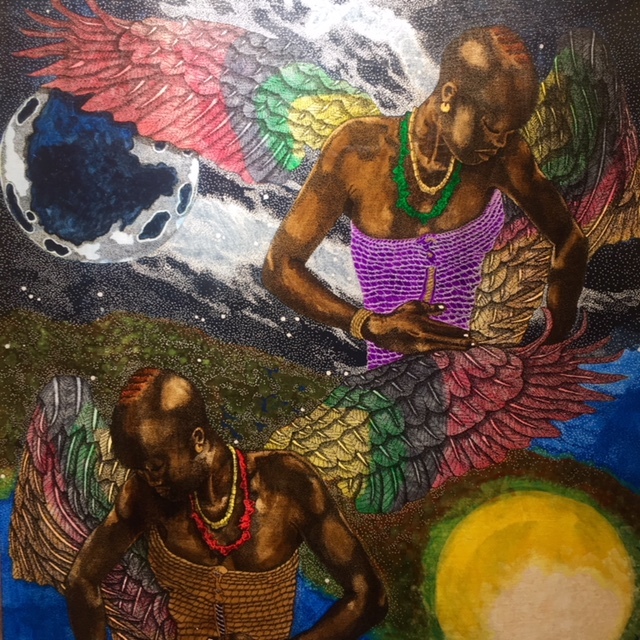 One of the artists who I routinely communicate with and visit at San Quentin is Mark Stanley-Bey who created ORISA’S RISING (Acrylic and Ink). In the series of images provided for your viewing pleasure, I also included information about this piece. What the art title card does not mention is that it took Mr. Stanley-Bey no less than 1000 hours and three months plus to create this piece! The detail in this painting is simply crazy. A must see! 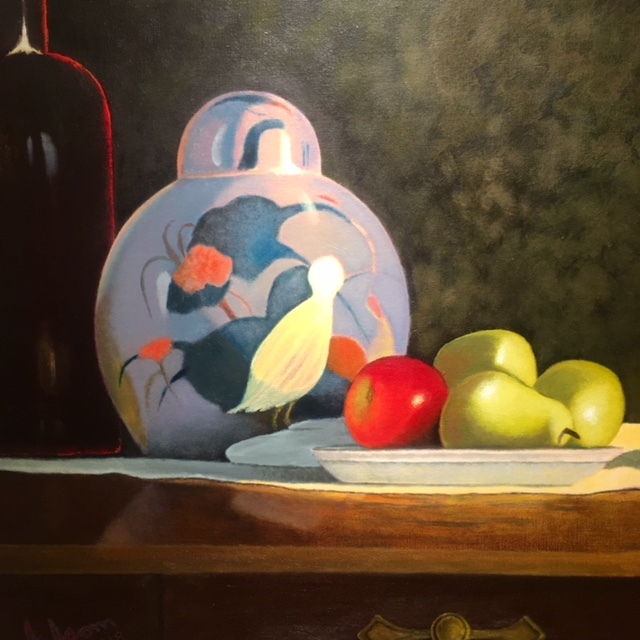 Other noteworthy pieces of art (but certainly not exclusively) include a detail from Lumumba’s SHE’S ALREADY BLESSED (oil); Ned Axthelm’s SUNK (acrylic); Lamis Comundoiwalla’s CANDICE (acrylic); Scott McKinstry’s SATYR (acrylic and Mixed Media); Jeffrey Isom’s STILL LIFE (Oil); and Bruce Fowler’s OF FIELDS AND RUST (acrylic). May this New Year 2019 bring you good health, sweet peace and much joy! 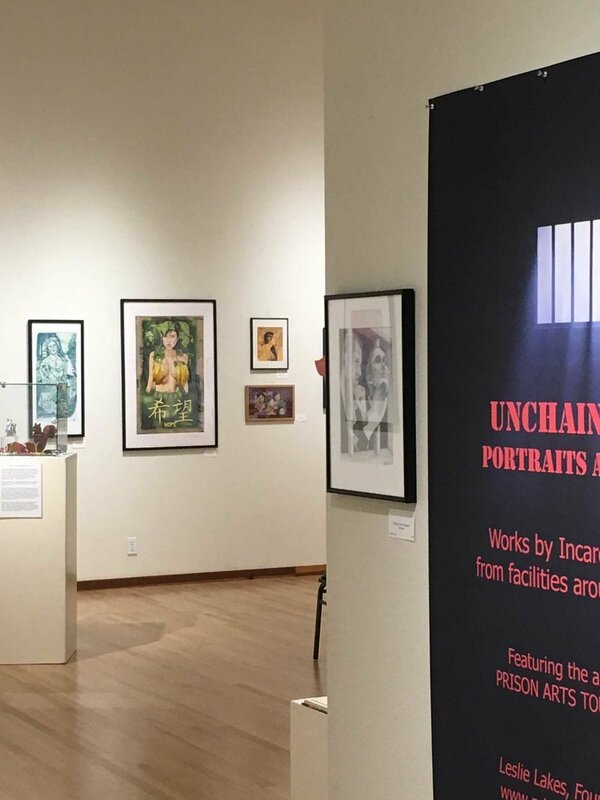 To herald the New Year artistically, PATH has collaborated with art curator and installer - Wendy Reiswig Bailey, as well as the GUALALA ARTS CENTER in Gualala, CA (Mendocino County) for a special exhibit titled UNCHAINED ART: Portraits and Dreams. In the event you plan to travel up that way, make sure to stop at see the show. I promise you, you won't be disappointed. Aside from framed original paintings and drawings, there will also be a collection of fabulous 3-dimensional pieces, including a variety of handcrafted items for sale. Opening Reception is Friday January 4th from 5pm-7pm (I'll be there!) and the exhibit will run thru Sunday, January 27th in the Burnett Gallery. Blessings, and as always, THANK YOU for your interest and support! CHRISTMAS SPIRIT IS ALIVE AND WELL! On Wednesday morning, December 12th, I set off on foot from Mill Valley, CA with four large plastic bags each filled to the brim containing a total of 50 brand new teddy bears and other sweet and cuddly, adorable animal plushies. I was headed to San Francisco and had to take two buses to get there. The first bust left several long blocks from my home in the direction of Marin City where I took a corresponding bus to San Francisco’s Tenderloin neighborhood. Initially the bus driver at Marin City said “Ma’am we can’t let you on the bus with all those bags” (he must have thought I was an indigent bag lady), but I adamantly insisted that I had no recourse but to get on the bus so I could deliver these toys to City Team, even if I had to pay extra fare for an additional seat. He let me on. I eventually made my way to the City Team’s office location at 164 6th Street off of Mission. Delivered these plushies just in time for the staff and volunteers to distribute and hand out to children in homeless shelters for this Christmas season. 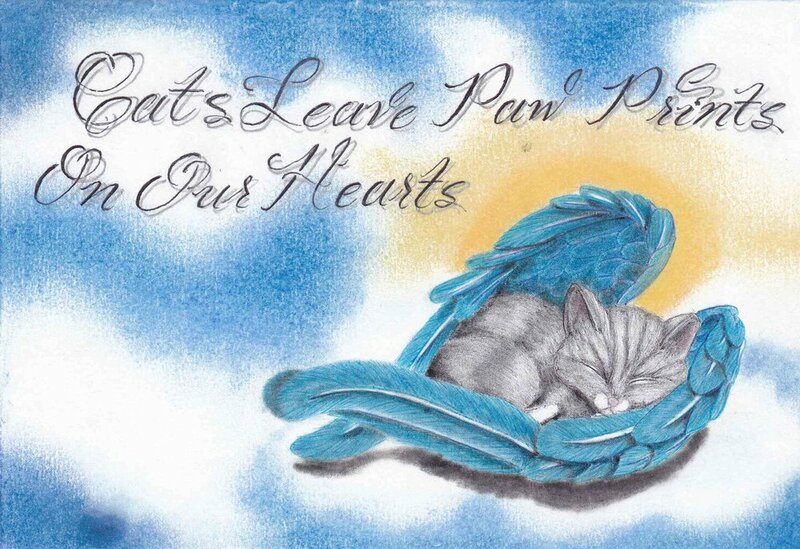 The stuffed animals were purchased from the Bearington companywith monies that PATH raised through the incredibly generous donations of artwork and handcrafted items that incarcerated artists sent us for this purpose. And, this coming Saturday, December 22nd, I will be returning to City Team to join their staff and volunteers as they hand out clothing, new blankets, food and toys. I personally will be providing foot washing and foot massage for anyone who happens to walk into their facility who requests it. Why are people so fascinated by owls? Is it because by their very persona and forward-facing eyes that these iconic birds of mystery closely resemble human beings the most? Or, is it due to our own perception of their sense of all-knowing and a feeling of deep wisdom? For centuries, owls have fascinated people and have been depicted in art, poetry literature and mythology. Owls possess large, forward-facing eyes and ear-holes, a sharp hawk-like beak and flat face (a facial disc around each eye and a conspicuous circle of feathers, The stereoscopic nature of the owl's forward-facing eyes and binocular vision permits the greater sense of depth perception necessary for low-light hunting. Owls can rotate their heads and necks as much as 270°. Unlike humans that have 7 neck vertebrae, owls have 14 neck vertebrae which makes their necks more flexible. But, what is so unique about their necks is that they also have adaptations to their circulatory systems, permitting rotation without cutting off blood to the brain. Birds (including owls) are the only vertebrates to have a fused collarbone (the furcula or wishbone) or a keeled sternum or breastbone. There are a total of 216 species of owls, 18 of which belong to the Barn Owl family and 198 to the typical owl family (i.e., Strigidae). In the USA, there are at least 19 species of owls and 16 types of these owls have been seen in Canada. Apart from the visual arts in prison settings, on occasion there will be theatrical workshops led by various groups and organizations.The one that I want to share with you is from a recent workshop led by The Actors' Gang, a professional theater company based in Culver City, CA that teaches in prisons as part of their community service. Actors' Gang members shown here are Jeremie Loncka, Hannah Chodos, Cady Zuckerman, and Kathryn Carner.This particular theatrical workshop took place at High Desert State Prison this past October 2018. The photos primarily feature a wonderful inmate artist and friend of mine – Mr. Rogelio Reyes. 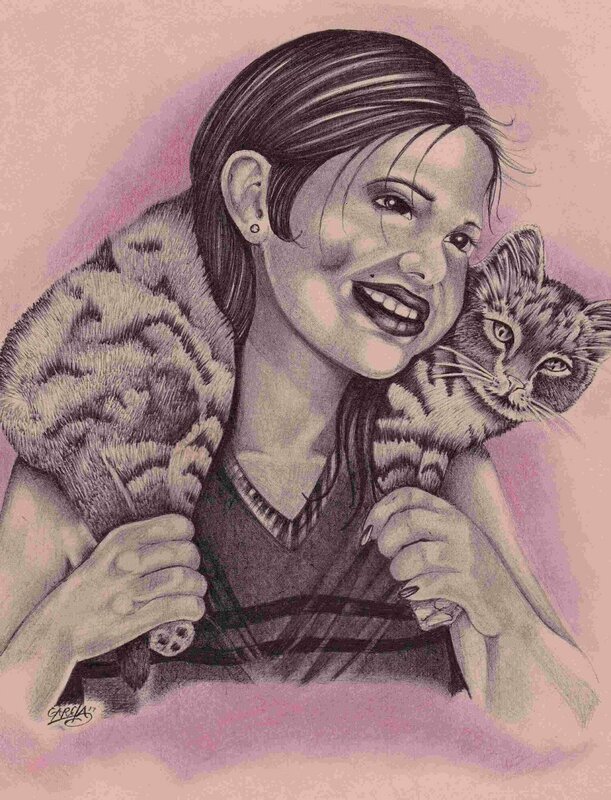 I first became acquainted with Rogelio in the beginning of 2006 when I bid on and won a drawing that he had created and submitted to NYC’s Fortune Society’s Fifth Annual Inmate Art Auction in 2005. 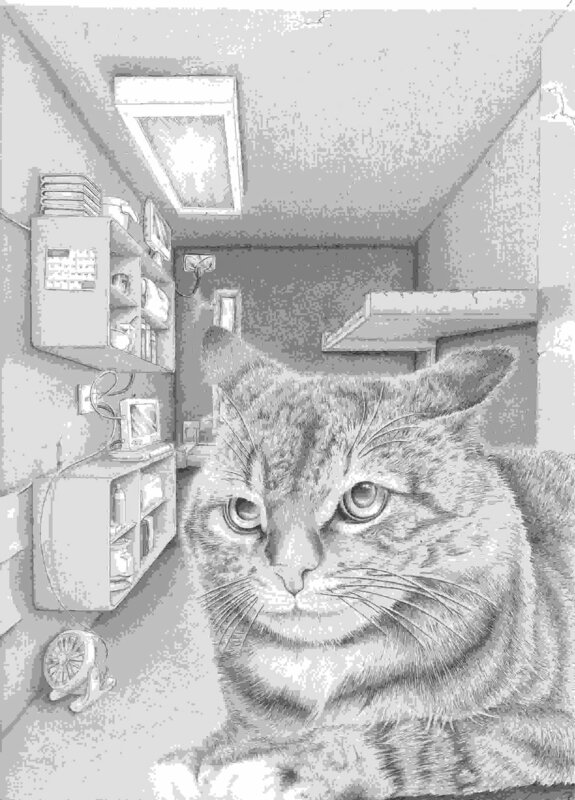 At that time, when I started to correspond with Rogelio to initially let him know how very much I appreciated his artwork. And we’ve been writing to one another ever since! When I finally relocated to Northern California from New Jersey in 2010, I was able for the first time to make arrangements to visit Rogelio when he was still incarcerated in SHU at Pelican Bay State Prison Crescent City, CA. 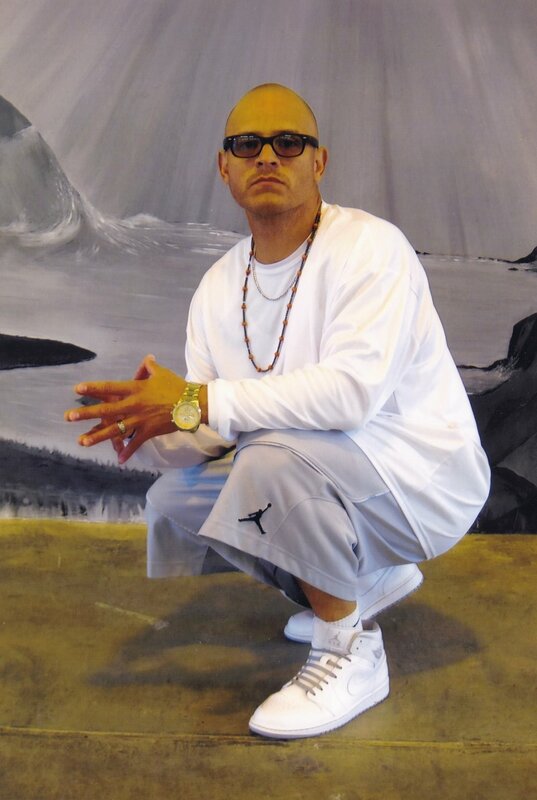 Currently, Rogelio is situated at High Desert State Prison, CA and is fortunately (thank God! ), no longer in SHU. Aside from being an excellent artist, Rogelio has seemed to have found a new talent and niche for the art of clowning! He is the clown with the bright red nose and golf caddy cap. Check out the photos (all taken by professional photographer, Peter Merts) and courtesy of the California Arts Council. What joy and fun these men had! I truly wish I could have been there! On a mild sunny, Saturday afternoon October 20th, I drove across the Richmond Bridge to Oakland to attend a special cultural event: CARE NOT CAGES - a collaboration between Prison Renaissance and Decarcerate Alameda County. Took the elevator from the inside courtyard lobby at 2633 Telegraph Avenue to the third floor to Suite 315, which opened up to a large high ceiling room with lots of light. After checking in at the formal registration desk up front, and picking up my copy of A PEOPLE’S GUIDE TO HEALING , I stopped by the coffee station (the organizers had set up a table with a beautiful spread of refreshments and nibbles, I was quite impressed) and took my seat up front. CARE NOT CAGES: A People’s Guide to Healing is a zine that features the multi-faceted and talented works (art, poetry, spoken word, essays, etc.) of inmates regarding their personal and collective struggles (cages); healing (care); resilience and resistance; learning, expression and disciplines, as well as their respective families, inside prison communities and connection to the outside world. Even though I arrived early, people were quickly spilling into the room and filling seats until there was left standing room only. 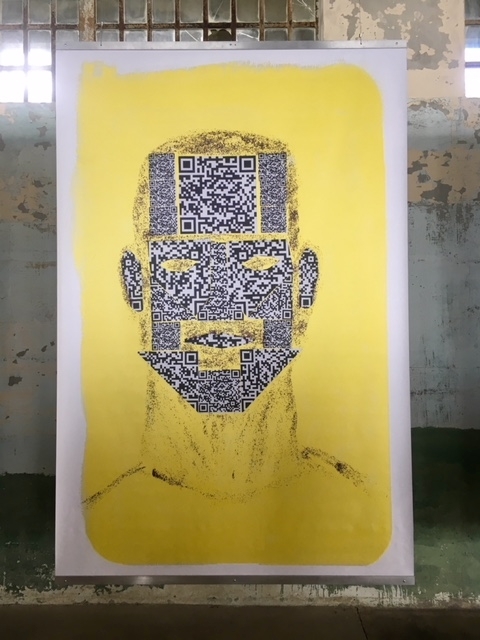 Prison Renaissance is a non-profit organization that uses art, media and technology to connect incarcerated people to the communities that need them. Decarcerate Alameda County is an Oakland based coalition of organizers and community members who joined to fight the construction of a new “mental health” unit at Santa Rita jail. What took place from 1:30pm-4pm was absolutely wonderful! A finely tuned orchestration of timely call-ins by inmates (located in different facilities) who participated in this creative zine project. Remotely, yet in real time, they were able to talk about their experiences, share their creative artistic and/or literary works and ask questions of the audience. Conversely, the audience was able to collectively or individually respond to and ask questions of these same inmates via a mic hooked up to the phone. While this was taking place, a large screen up front would project images of the inmate(s) and/or play a video of their work(s). The treat and surprise for me was to meet some of the very same inmates I knew from my volunteer days at San Quentin who had since been released. Care Not Cages is a (quote) …living, loving bridge. A bridge to connect people over walls and across time...to amplify so we can engage and heal together. This past Monday afternoon, with the help of Marin Civic Center custodian, Tom and a lovely High School intern - Kelsey Mazariegos – we installed a new inmate art exhibit within the Public Defenders’ office at the Marin County Civic Center in San Rafael, CA. 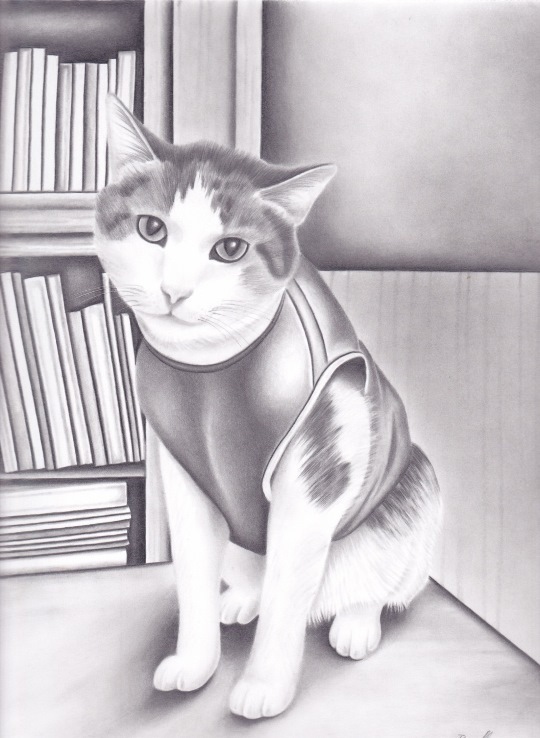 I affectionately titled this new exhibit ANIMAL HOUSE, which comprises 16 pieces of framed original artwork in various styles and mediums by incarcerated artists from around the country. 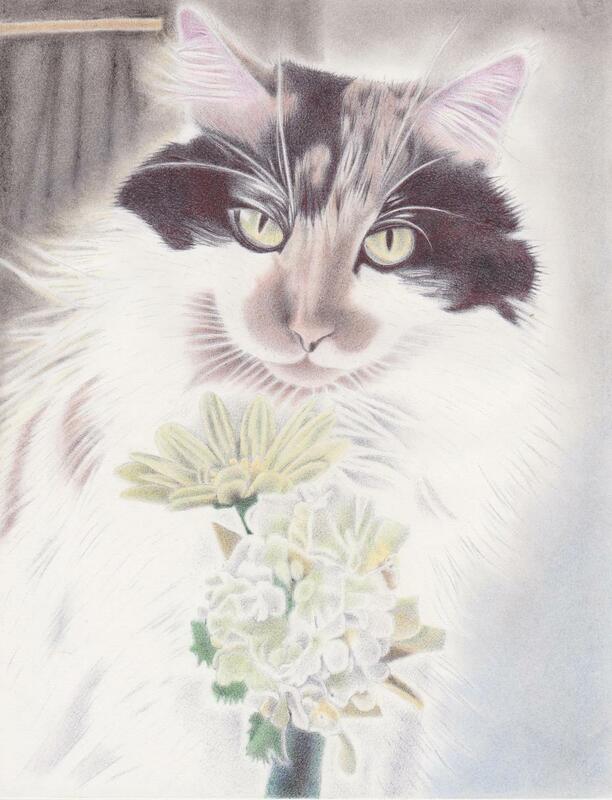 Art includes cats (large and small, domestic and wild); dogs, bears, fish and birds. The show will be up for public viewing purposes for the next three months (thru the end of January 2019). My appreciation goes out to both Jose H. Varela (Public Defender) and Carol Farrer (Deputy Public Defender) for making these rotating exhibits possible. Art credits: Bear and butterfly black ink drawing by Manuel R. Sanchez (CA); Green Leopard and Pitt Bull Buddies by Pete Zarogoza, (UT); Mama owl and baby owls in nest ink drawing by David. M. Shaw (CA); Black Labrador acrylic painting on canvas by Ben Howard (PA); Leopard ink drawing by Brad Hart (CA); Wood Duck colored pencil drawing by Christopher Avitea (CA); Parrots colored pencil drawing by Gilbert Loza (CA); Golden Retriever drawing by Ernie Garcia (formerly incarcerated CA); Chihuahua in Tea Cup ink drawing by Brad Hart (CA); Wolves painting on board by James E. Atomancyzk (TX); Rex domestic cat drawing by Coleman Pannell (formerly incarcerated in KS); Presa Dogs drawings by Rogelio Reyes (CA); Panda acrylic painting on board by Joseph Miller (PA). On 9/14, five days following the 9/9/18 Teddy Bear ‘Tea Party’ fundraiser at the Book Passage, I drove over to the Elks Lodge in San Rafael with my car laden down and packed to the brim with all things teddy bear related to set up for a fun family evening of youth craft activities, food and ukulele music. The ELKS are wonderful in that they fully support their members' community and charitable interests through such actions as providing a venue, volunteers or funds in support of their good causes. Kids were invited to bring their own teddies to bounce around with in the large Bouncy Castle that was set up under the wedding arbor in their outdoor garden. It remained a beautiful warm sunny day all day, which lent for an equally lovely evening for this event. Aside from fabulous teddy bear art and an array of craft items (including handcrafted collectible teddies) made and donated by incarcerated artists specifically for this event, there were many other teddy bear items ranging from vintage mechanical wind up teddies, to jewelry, lamps, blankets, books, cookie jars, tea sets, embroidered linens, Christmas tree ornaments, and so forth. Professional caricaturist, Pete McDonnell was also on hand to provide his uncanny gift of caricature drawings…and as you can see, Pete sure nailed the images! My niece, Hannah and her friend, Tabby (both sophomore High School students) offered to provide teddy bear face painting, for the little ones. A large bouquet of multi-colored polka dot balloons by Balloons by Design, helped lend an even more festive ambiance. Aside from the yummy family dinners sold by the Elks Lodge, receipts from sales of teddy bear items went directly to PATH so that PATH can purchase brand new teddies and assorted other plushies to give out to children of incarcerated parents during the end of the year seasonal holidays. I’d like to personally thank the Elks Lodge and their volunteers, as well as everyone else who helped PATH make it a special and rewarding event. 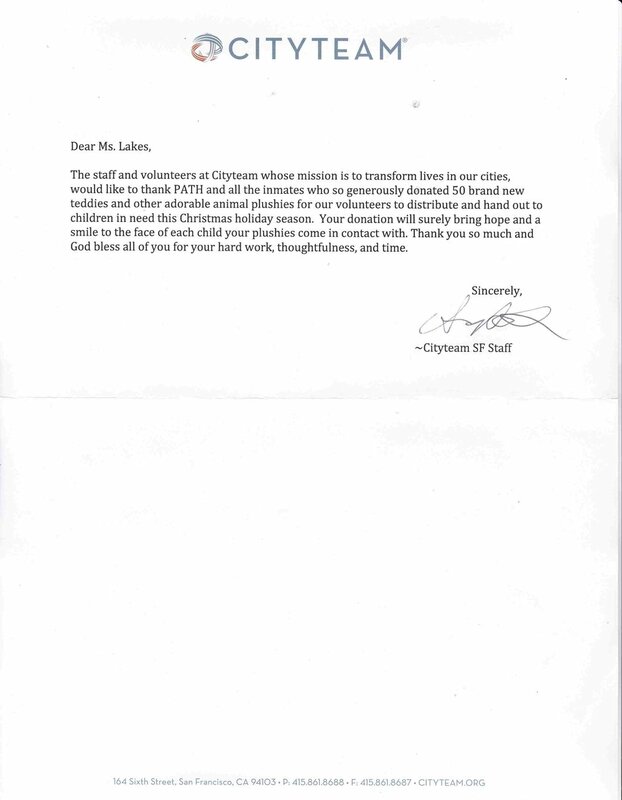 If you wish to make a donation to PATH so we can continue this program, please feel free to do so HERE. On a super sunny, Sunday September 9th afternoon, PATH (in collaboration with both Kids Cooking For Life and CANDO Clemency Teddy Bear Program) presented an engaging and charming ‘Teddy Bear Tea Party’ fundraising event. The event fell on none other than National Teddy Bear Day and was hosted by the Corte Madera Book Passage. Young children (accompanied by their parents), came out for lots of eats and treats and fun hands-on activities. A festive and colorful polka dot balloon bouquet was donated by Balloons by Design. And, each child who attended the event received a goody bag which comprised of a teddy bear “EAT THE RAINBOW” (copyrighted 2018) coloring book package (created especially for this occasion) complete with crayons, teddy stickers, temporary teddy tattoos; teddy bubble wands, a Yumm Earth lollipop and a grain free snack bar. One of the main attractions at this event was face painting services by Budderball the Clown. Budderball did an amazing job! After ice cream was served, the little ones marched to the teddy bear beat led by Book Passage storyteller, Clare Doornbos for teddy tales. A teddy themed gift basket was raffled off and featured a very special book by internationally renowned, artist/photographer, William Wegman. On my personal request, Mr. Wegman donated his book – BEING HUMAN. Mr. Wegman not only signed, but also created a super sweet, original teddy and dog friend drawing on the inside page. The main purpose of this event was to raise funds to (1) purchase brand new teddy bears (and other cuddly stuffed animals) to hand out to children of incarcerated parents at the end of this year and future seasonal holidays and, (2) help benefit Kids Cooking For Life non-profit in Marin County, CA. I’d like to personally thank everyone who helped me put this event together…who donated their time and services to make it a special and rewarding event. GIVE BACK WEDNESDAY AT MARIN PIZZA! Have a hankering for delicious flavorful and healthy artisan pizzas (including gluten free dough), and local beer on tap? If so…c’mon out next Wednesday (9/26) for Marin’s first ever “farm-to-table / make your own pizza” at MARIN PIZZA within the Corte Madera Town Center! 10 % of receipts will go to support my 501 (c) 3 Marin County non-profit – PATH. Not in the mood for pizza? No problem! They have a wonderful assortment of ‘farm-to-table salads’, as well. Have a sweet tooth? No worries. Plenty of fine desserts to finish the meal off with, too. Restaurateur partners, Tom Wyman and Michael McGuan bring their vision and mission by partnering with local farmers and ranchers to provide sustainable healthy fare. To learn more about their innovative operation, log on HERE! Again, Wednesday, September 26th. MARIN PIZZA...right under the tower clock! I look forward to seeing you there! In prison, inmates are stripped of individual identity. They are given identical clothing and must wear a specific number to replace their name. Self-expression must be enabled even for the most disenfranchised members of society. When art is supported in prisons it allows inmates to have a personal identity while allowing a more positive and constructive environment to exist. Individuals serving sentences can explore self-expression and translate complex emotions into physical objects by creating art. Although prisoners are limited as to what supplies they may use, just one look at some of the art being produced one can see the emotion that must have gone into their artwork. An article for the New York Times supported art as a form of therapy in prisons. “Art-making is one way inmates can combat the “mortification process,’ the loss of self suffered by prisoners. It is a way to remain fully alive in a place that deadens the spirit.” Art allows prisoners to put energy towards creating something positive, something that others get to experience and even may get joy from. Furthermore, when inmates are able to produce something of their own a sense of pride may be found. Generally, people who have made bad decisions may be a victim of their circumstances. They may have never learned right from wrong or had to violate laws for survival. Complex emotions may be better understood by prisoners when they can make something of their own and have a better sense of individuality. “‘I don’t have much of a legacy,’ Jeffrey Sutton, who is serving 41 years for armed robbery, said of his life. ‘This is something positive that helps me focus on getting out,’ he added, daubing flecks of green onto the leaves of a jungle vine,” (Brown). Art allows prisoners to transmit messages and convey their emotions. 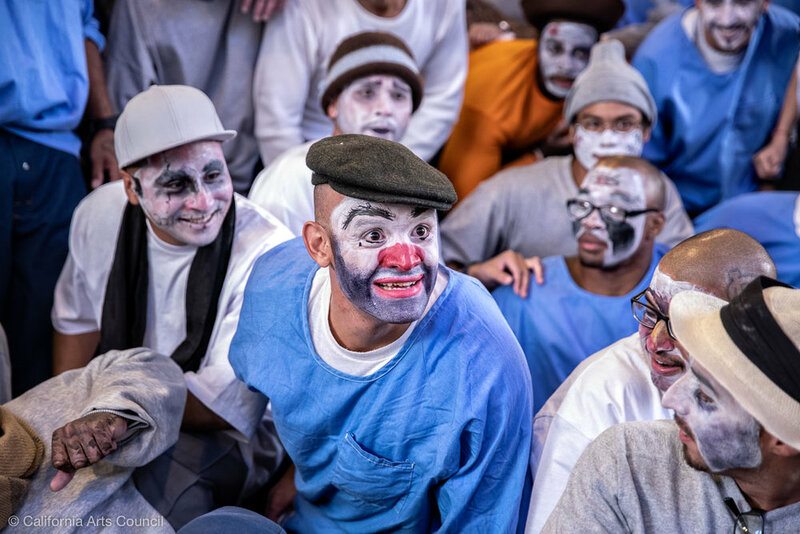 Currently in California, the role of both visual and performing arts in prison is increasing. Established artists such as Guillermo Aranda can serve as mentors for prisoners by visiting and teaching at prisons. “The mural class for high-level offenders is part of a new initiative by the State of California to bring the arts — including Native American beadwork, improvisational theater, graphic novels and songwriting — to all 35 of its adult prisons, from the Richard J. Donovan Correctional Facility near the Mexican border to Pelican Bay, the infamous supermax just shy of the Oregon line,” (Brown). Furthermore, “In (California with) a political climate in which federal arts agencies are under siege, the state has allocated $6 million annually for the Arts in Corrections program, a figure set to rise to $8 million next year,” (Brown). California serves as an example of letting the arts expand in prisons, and the great outcome of it is evident in the art produced. Art has proven to be very therapeutic, from calming paint strokes to releasing scribbles. Psychology Today believes that art allows for a greater understanding of emotions and that it “can be used as a springboard for reawakening memories and telling stories that may reveal messages and beliefs from the unconscious mind,” (Psychology Today). I was inspired to write this when I saw the art my good friend’s mother, Jamie Weinstein, received from inmates at San Quentin. She is involved in several advocacy councils for prisoners and has several pen pals. The emotion was visible on the piece I saw hanging in Weinstein’s living room. Visual and performing arts overall allow for personal reflection and a greater personal identity to be formed from even the most disenfranchised members of society. Interview with Jamie Weinstein. Conducted over in person in 2017 and email June 2018. Art images courtesy of Jamie Weinstein. A SAN RAFAEL BEER PUB GIVES BACK! A SUPER HEARTY THANK YOU to IRON SPRINGS PUBLIC HOUSE PROPRIETORS AND STAFF! And to all the folks who came out for food and beverages in support of their GIVE BACK MONDAY night, July 16th, 2018! As you can see, everyone had a great time at their new San Rafael location, and the house did well that night, too landing PATH a fabulous 10% from receipts of sales by patrons that evening. Again, thank you to everyone who participated in this special fundraising event. HIGH SCHOOL LAW INTERNS HELP P.A.T.H. 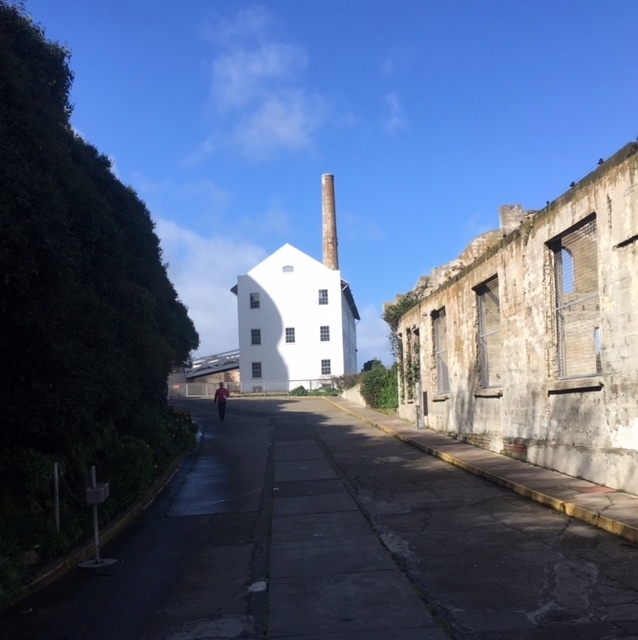 On Friday, July 20th, I headed by car with a trunk laden full of artwork to the Marin County Public Defenders’ office (Room 139; 1st Floor within the Marin Civic Center in San Rafael) to rotate artwork from last year’s “Art Escape at Alcatraz” show. 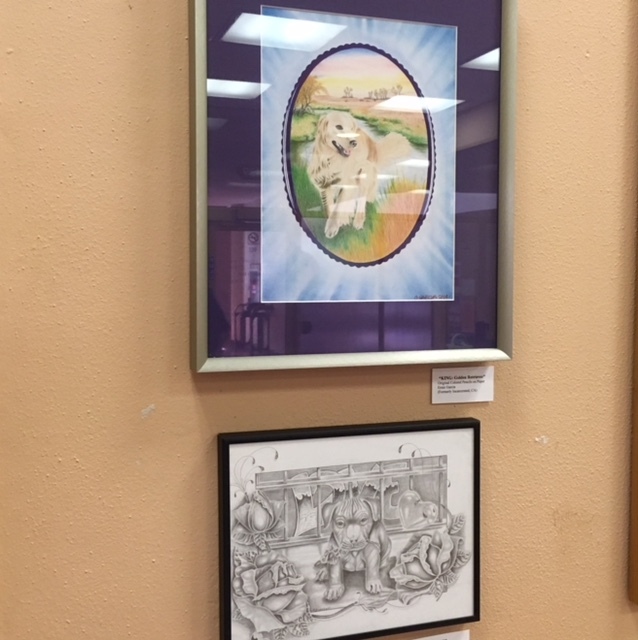 If you recall, on April 9th, with the help of custodial engineer - Tom, we installed 12 pieces of original framed artwork all created by incarcerated artists from around the country. I promised to make this a rotating art exhibit and was bringing fresh new pieces to install, but desperately needed help. 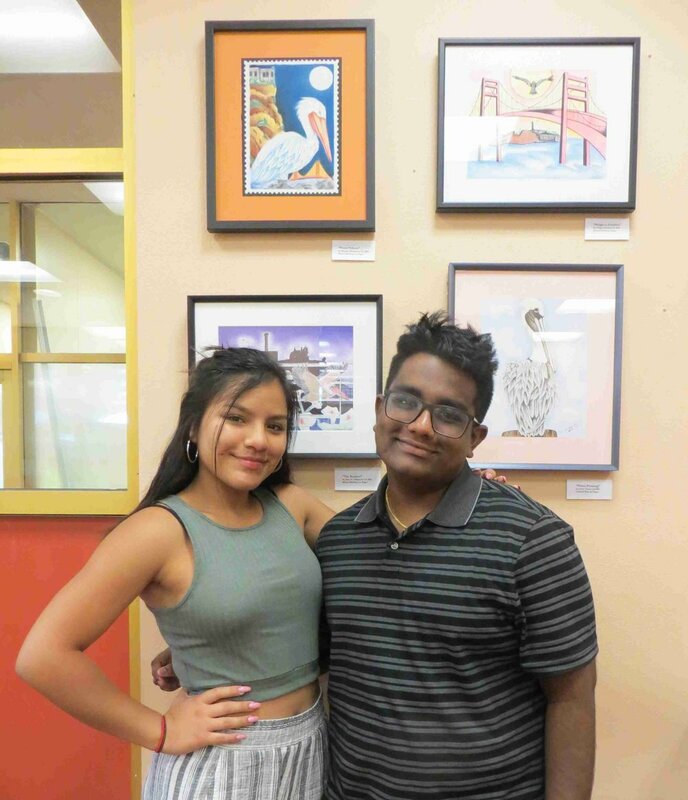 Tom was not available, but two eager and willing Summer 2108 Public Defender Interns were ‘Johnny on the spot’: Priscilla Cardenas (a lovely vivacious High School student soon to enter her Junior year) and smart and savvy, Krishna Menon (who recently graduated from High School and by Fall will be entering his first year of college on the East Coast). I give them both a lot of credit. Their assistance was invaluable in time saving efforts, as well as feedback as to aesthetic placement of the art. And, we succeeded to fit all 12 new pieces of art on the outer public office space walls. Good job! 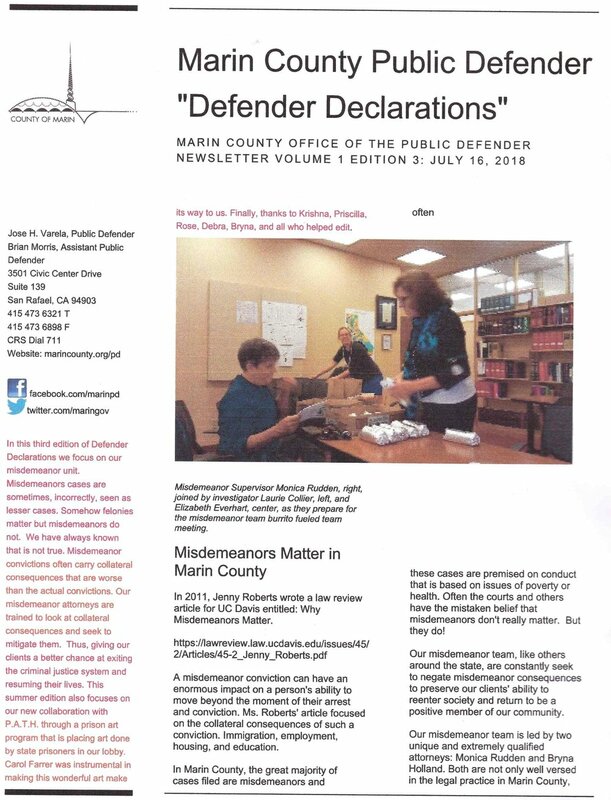 If this wasn’t enough, you can imagine to my surprise and delight, that the Marin County Office of the Public Defender July 16th Newsletter (Vol. 1; Edition 3) featured P.A.T.H. ‘s precious art exhibit there. When I first connected with Public Defender, Jose H., Varela about P.A.T.H. 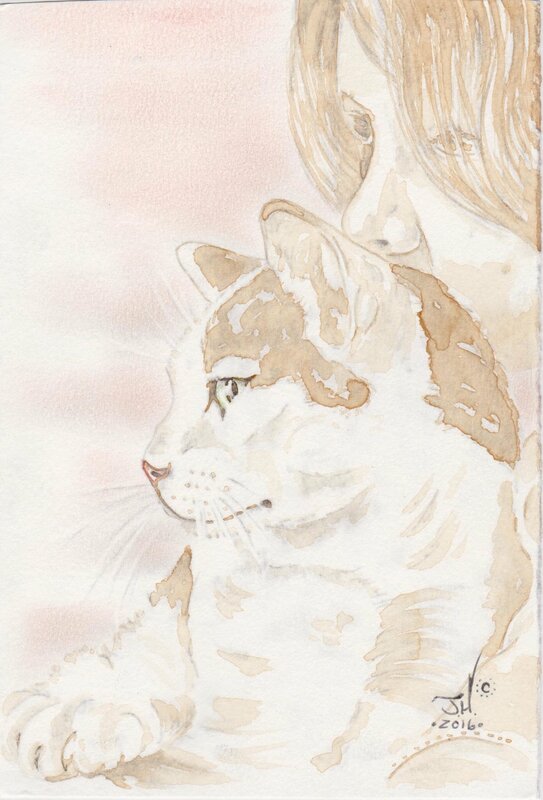 and sharing the artwork, his response was: “Leslie, this looks like the start of a beautiful friendship. A blatant steal from Casablanca but what the heck”. And, just the other day, Deputy Public Defender, Carol Farrer commented: “The artwork in the lobby is outrageously great. So meaningful to see and read the stories behind the art. Thank you for your time and dedication to showing the world the humanity, beauty and talent in all of us (well, I guess some of us have much more artistic talent than others!)”. So, if you happen to be in the vicinity of the Marin Civic Center (Frank Lloyd Wright building), please take a few minutes to stop by their office to take in the show. Thanks, always for appreciation, love and support. NOTE: Priscilla and Krishna are each standing next to their respective favorite pieces of art in this show. 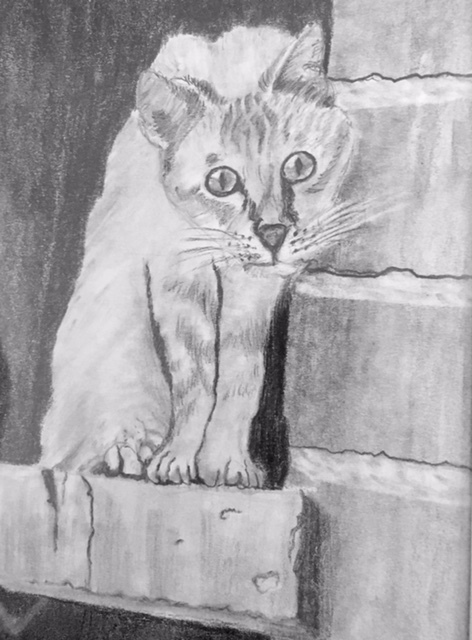 I love lemurs and was enchanted by this mixed media drawing of a lemur that I recently received, which was created by an incarcerated artist. 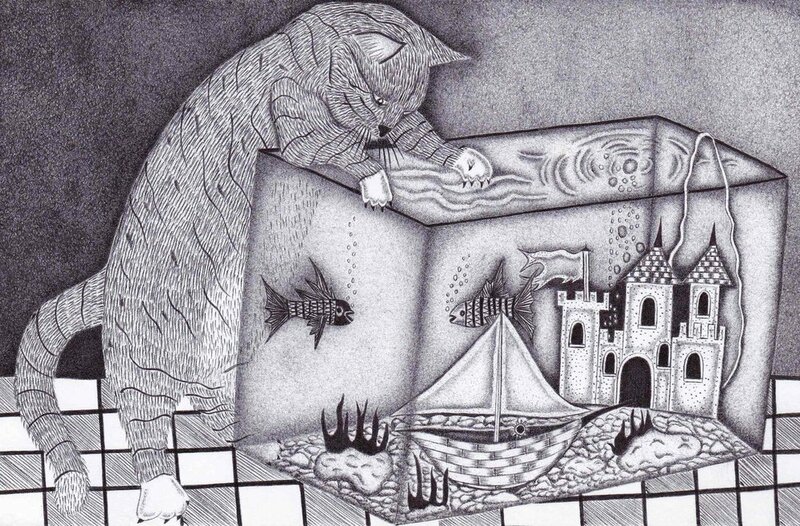 The drawing measures 9”x12”. Did you know that there exists 101 extant species and subspecies of lemurs that are then divided among 5 families and 15 genera; ranging in weight from 1.10z (Madame Berthe’s mouse lemur – so cute!) to as much as 21 lbs. for the Indri lemur. If you haven't been to SAFARI WEST in Santa Rosa, I highly recommend it. There you will find lemurs, as well as a myriad of other animals and birds on their 400 acres Sonoma Serengeti private wildlife preserve. Their tail is longer than its body! Male ring tailed lemurs put smells, from glands in their bottoms, on their tail and wave it at rivals. Lemurs have two tongues! Under a lemur's main tongue sits a smaller secondary tongue made of stiffer cartilage. This is the grooming tongue, used as they clean other lemurs. The lemurs can move the insects into their mouths as they groom their friends for a tasty snack. Pretty nifty, heh?! DID YOU KNOW that many juvenile squirrels die in the first year of life? But, if they do survive through adulthood, they can have a lifespan of 5 to 10 years in the wild. And, some can survive 10 to 20 years in captivity. Premature death may be caused when a nest falls from the tree, in which case the mother may abandon her young if their body temperature is not correct. Many such baby squirrels have been rescued and fostered until they could be safely returned to the wild. DID YOU KNOW that the English word "squirrel", first attested in 1327, comes from the Anglo-Norman “ Anglo-Norman “esquirel”, which is from the Old French escurel, the reflex of a Latin word “sciurus”? In turn, this Latin word was borrowed from the Ancient Greek word σκίουρος, skiouros, which means shadow-tailed, referring to the bushy appendage possessed by many of its members. DID YOU KNOW that squirrels have their very own “APPRECIATION DAY”? And, here are 22 other things you may not know about squirrels!